That’s what a tempered glass patio door looks like after it’s suffered what I’ve learned is called “spontaneous breakage”. Though in this case, it might be only semi-spontaneous, as I had tapped that same window with a shovel when I was clearing the adjacent deck of snow. I didn’t notice the window cracking or otherwise looking damaged just after I popped it with the shovel, but when I was all done shoveling (around a half hour later) and kneeling down clearing slush out of the track so I could close the door properly, I was startled by noise that sounded like someone had thrown an ice ball at the window. 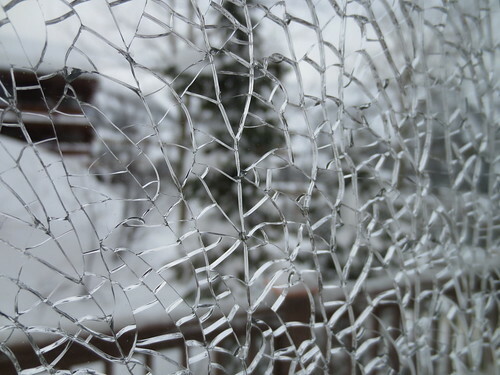 I looked around for the culprit and only then noticed the glass had shattered, but had not fallen. For quite a long time after the initial pop and shatter, it sounded like hail was hitting the window as more and more small cracks appeared. It was oddly fascinating to watch and try to catch them forming. By the time we went to bed (I’d been shoveling after dark) it had pretty much stopped cracking. I was surprised that all the glass, save three or four small pieces, was still in the frame the next morning. That’s when we learned that Christmas week is no time to get a window repaired. The first place we called doesn’t do residential glass in the winter at all. We (by which I mean Mr. Karen) did find someone who does, but first they’ll have to come out to measure and that’s not happening until January, which is why I was stabilizing the glass with tape today. Even in its current state, it does still provide some insulating value, so we didn’t want to knock it all out just yet. And now if it does fall down, it will be mostly stuck to the tape and easier to pick up. That’s the theory, anyway. What I do know for sure is it’s not a good idea to try and smooth tape over a broken window with ungloved hands—yeah, I know that seems obvious, but I was more concerned with being able to have a good feel for how hard I could push and not getting gloves stuck on the tape. I got a few small scrapes before I wrapped Band Aids around the parts of my fingers I was smoothing with, leaving my tips free to wrangle the tape. Now I’m just keeping my fingers crossed that the tape holds long enough to get a new pane of glass in there. It does look kind of pretty, though!